For me, the countdown to Christmas day is as exciting as the event itself. I just love all the buildup and anticipation. 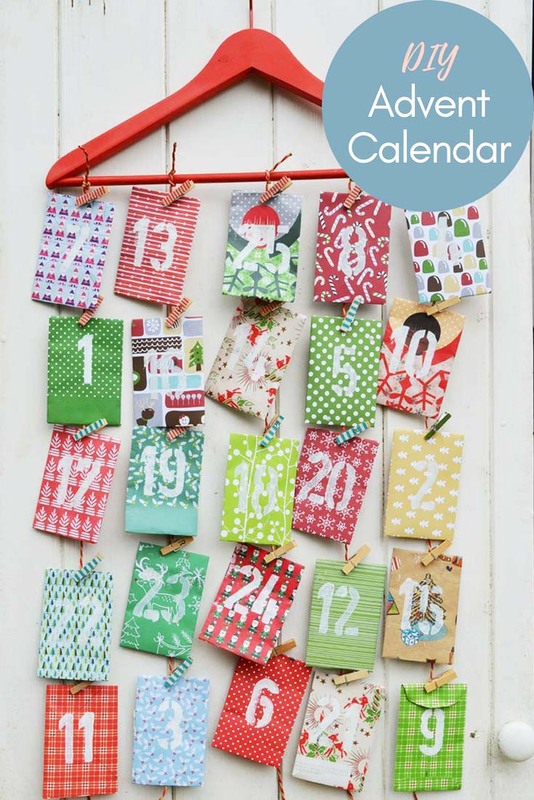 What better way to start the countdown to Christmas than with an advent calendar. Homemade ones are the best, as you get to choose what you put inside them. 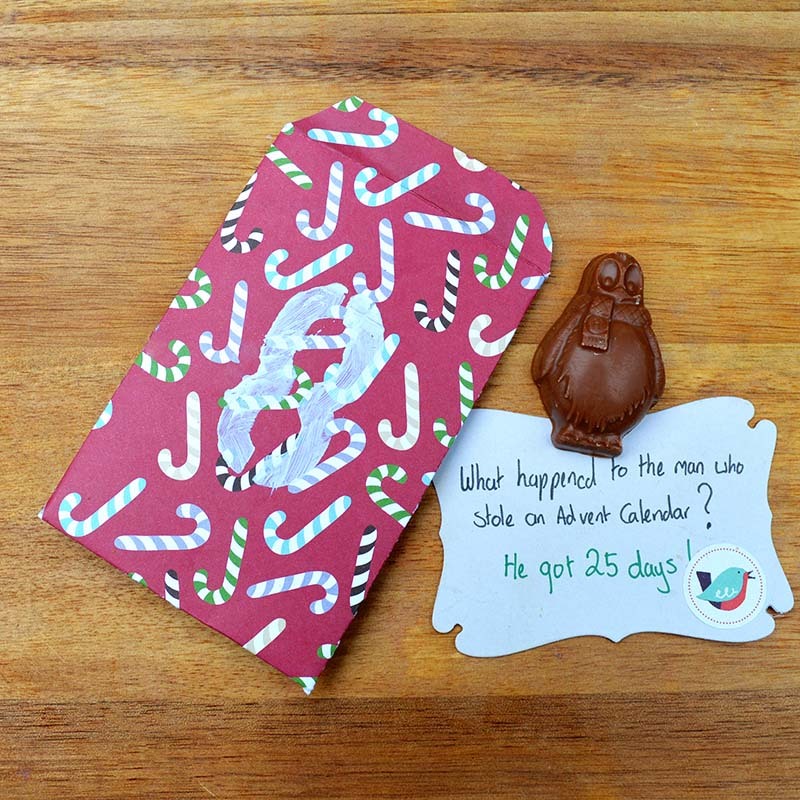 With this paper envelope advent calendar there is a chocolate treat and cheesy Christmas joke for each day. The calendar is very easy to make. I used Christmas craft paper to make mine. However, you can use any paper from upcycled Christmas wrapping paper, old book pages and even maps to make yours. So many possibilities! 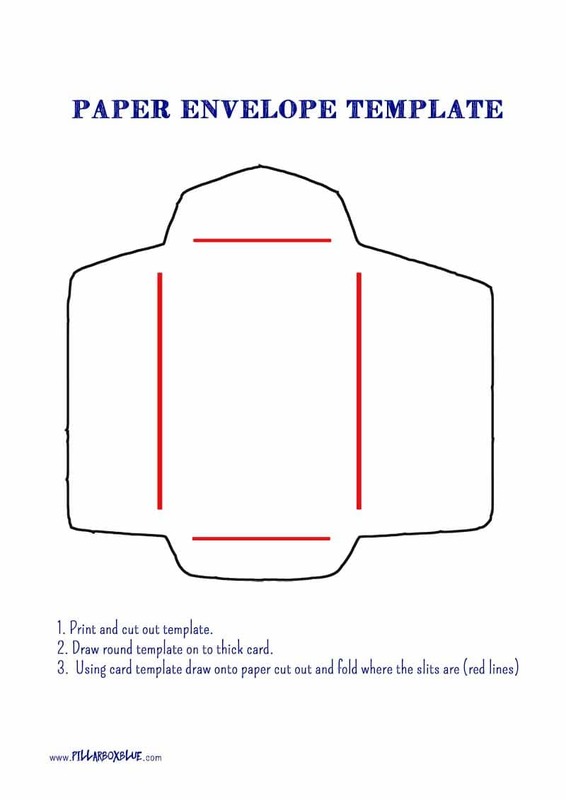 Envelope template : You can buy one cheaply online or you can download this one here (Envelope template) and cut your own out of cardboard. Christmas paper, can either be craft paper, old wrapping paper or even Christmas paper out of magazines. I use a combination of all these. 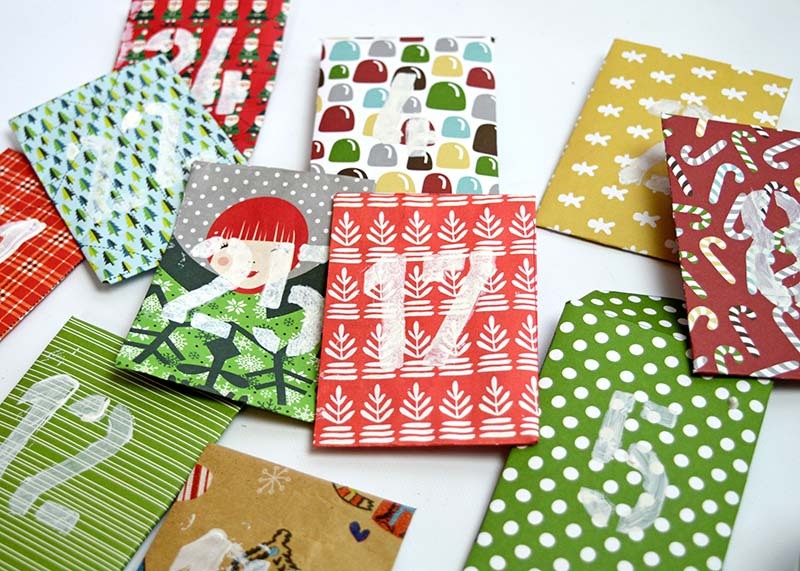 Using whatever Christmas paper you have chosen, make the mini paper envelopes. Use the template for this. You will need 25 envelopes or 24 if you are a 24-day advent calendar kind of person. I have found that there is a big debate on whether advent calendars should be 25 or 24 days. Personally, I think you should just do how many days you like. I’ve even seen shop bought advent calendars go up to New Year’s Eve! 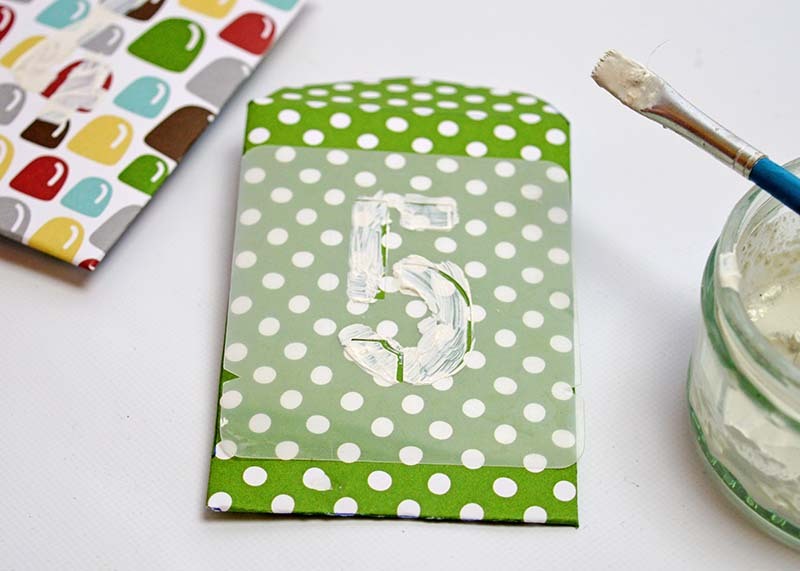 Next, stencil, draw or paint a number on each envelope 1 – 25. Then fill them with treats and jokes. When all the envelopes are made it’s time to decide how you want to hang them. I spray painted an old wooden hanger red and then hung my envelopes from this using the craft pegs and twine. Doing it this way enabled me to hang it easily on the back of boys bedroom doors. You can of course just hang them on the string like bunting. You may have noticed I have hung my numbered envelopes in a random order, that’s just a personal preference. For me, part of the fun of an advent calendar is hunting for the right day. Also in life, I generally err on the side of randomness rather than order and symmetry. What do you put in your advent calendars? As children we used to have those paper calendars where you’d open the window each day to reveal a different picture there wasn’t a chocolate in sight. Now there would be a mutiny if my boys didn’t have a daily sweet treat in their calendars. But I think they like the cheesy jokes more, even though they won’t admit it. One of the best advent calendars I had was from my husband, and everyday there was a different alcoholic chocolate truffle. If your a bit short of Christmas jokes the Telegraph compiled a list of the best 50. With 3 boys in our home we have more than one advent calendar each one different. 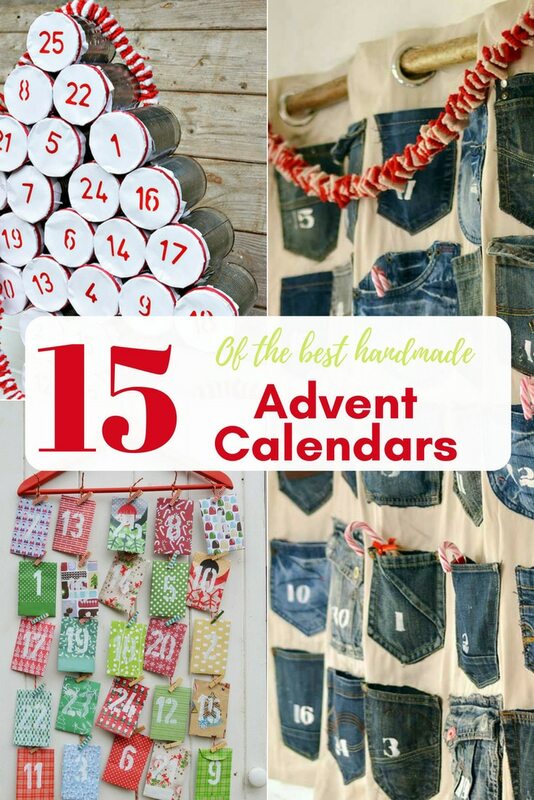 If you are looking for more ideas for DIY advent calendars you should check out my tin can upcyeld advent calendar or my jeans pocket handmade advent calender. That’s clever. I made a very basic similar advent calendar for my husband years ago (he felt he was missing out when the kids were opening their’s each morning!) and just cut old manilla envelopes in half thinking it would be a one off funny thing for us to do. We used that same tatty old thing for YEARS! I think an upgrade might be in order, he would love one like this. Thank you, Julie that’s a lovely story. Look forward to seeing the feature. Claire this is so simple to make and yet so adorable. That is what Christmas should be all about. Making crafts with the family and then enjoying the holidays. Not running around spending money ton tons of things others may or may not want. You obviously have many fond memories from your advent calender’s. Thank you Mary. That is my favourite part of Christmas is the making. I would love it if everyone made their gifts. I always have loads of things I want to make at Christmas, I’m working on about 6 different crafts at the moment. I really enjoy all the variations of diy advent calendars. They are so much nicer than their commercial counterparts. Love this one with the various colours. Thank you Leanna, I always love a bit of colour. Thank you, it is really simple and fun to do. Adorable! Thanks for sharing at Vintage Charm–pinned & tweeted! Thank you, we love homemade advent calendars in this household. I love the way you hung it over the fireplace mantel with the pins – beautiful and festive. Also, I like that you put them in random order! 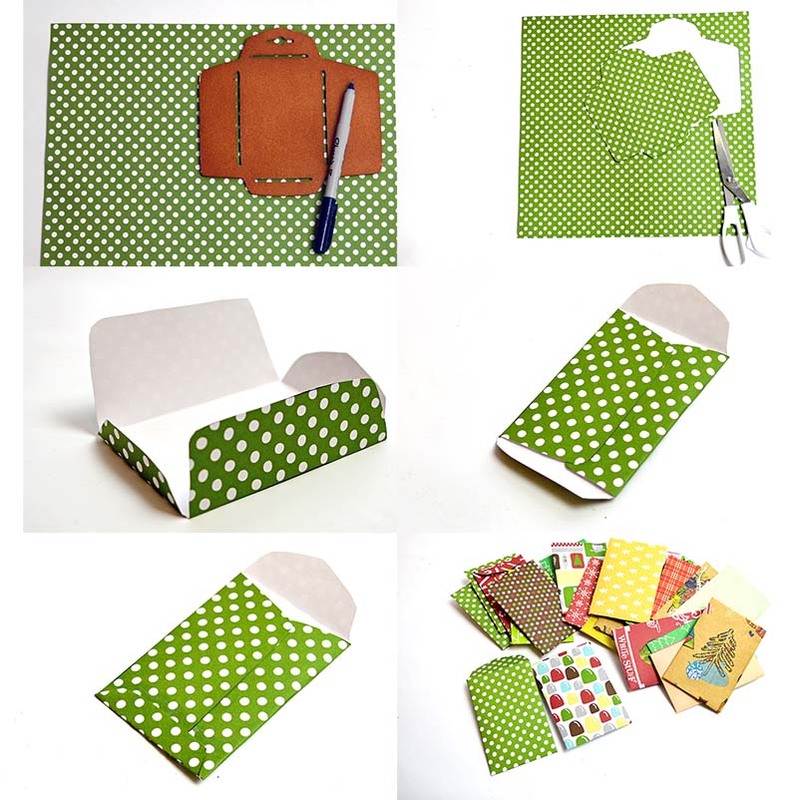 And it’s a great way to use up old Xmas scrapbook paper….so I can finally buy some new ones! Thank you so much. I like to have them in the random order as I think looking for the right day is all part of the fun. Super cute and creative! In order to keep my curious 8 year old still believing in Santa, I need to make a new Advent calendar (brought my our Elf on the Shelf) this year. Great idea! Visiting from Sweet Inspiration party. Thank you, I know from my boys 8 is when the doubts about Santa creeps in. 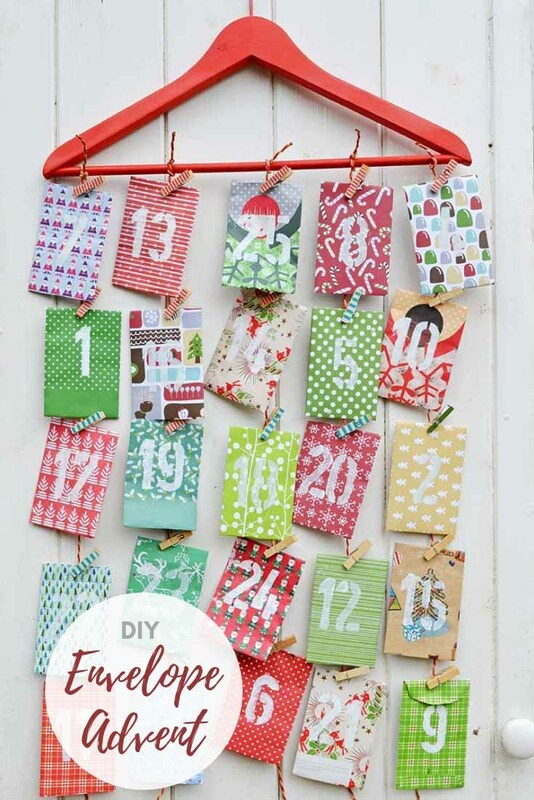 This is such a cute advent calendar! My kids and I made one a few years ago and it always adds something special to the holidays. Thanks for sharing! Thank you, we love it when it’s time to get out the advent calendars it really puts us into the festive mood. 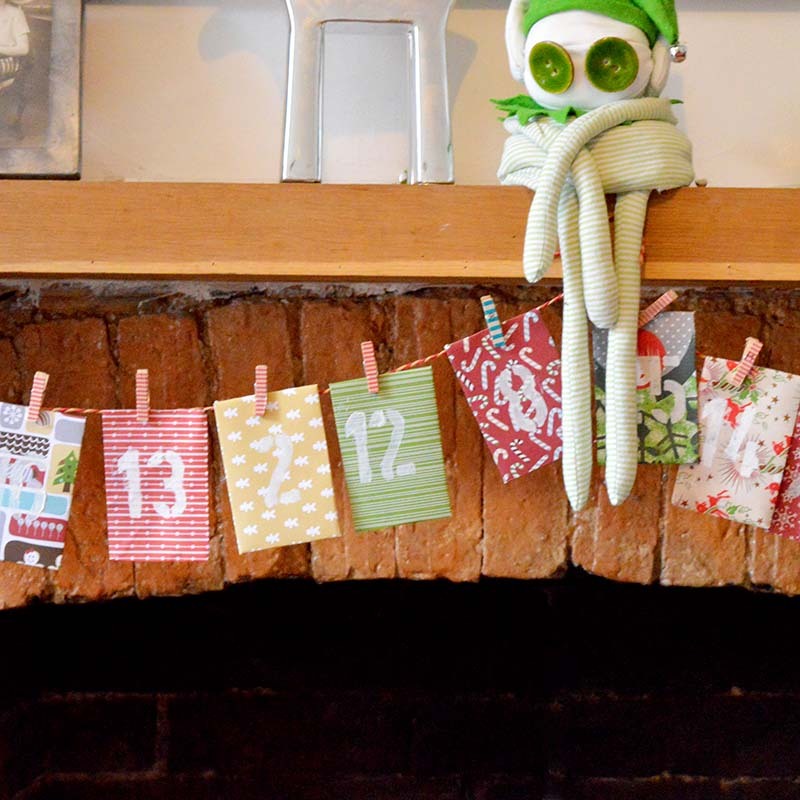 Homemade advent calendars are great you can fill them with all sorts of fun things. When my boys were little I used to put lego in the pockets. My girls would love this! I love that you used all the different papers and the clothes hanger! Such a cute idea Claire! Love all of the different patterned paper that you chose! This advent calendar is lovely! I love the selection of papers you used, and I really love that red hanger! I’m so glad you shared this at the Christmas In July Blog Hop! Have a great weekend!! Thank you very much ! I have some more Advent calendar ides for this year. I love this project Claire!! May steal the idea this Christmas… Lol. Readers are sharing their Coat Hanger projects tomorrow and I hope you’ll stop by to share this one! Thank you ! I will stop by as I also have another coat hanger project some fabric bird cages I made. That is absolutely adorable! I can’t decide if I like the hanger better or the string bunting–they are both so cute. Great idea. Thanks ! I know what you mean, I suppose it all depends how much space you’ve got to hang it. The convenient thing about the hanger is you can put on the back of a door and it’s more portable. What a fun Advent calendar! I love these. Thanks for sharing at My Flagstaff Home! 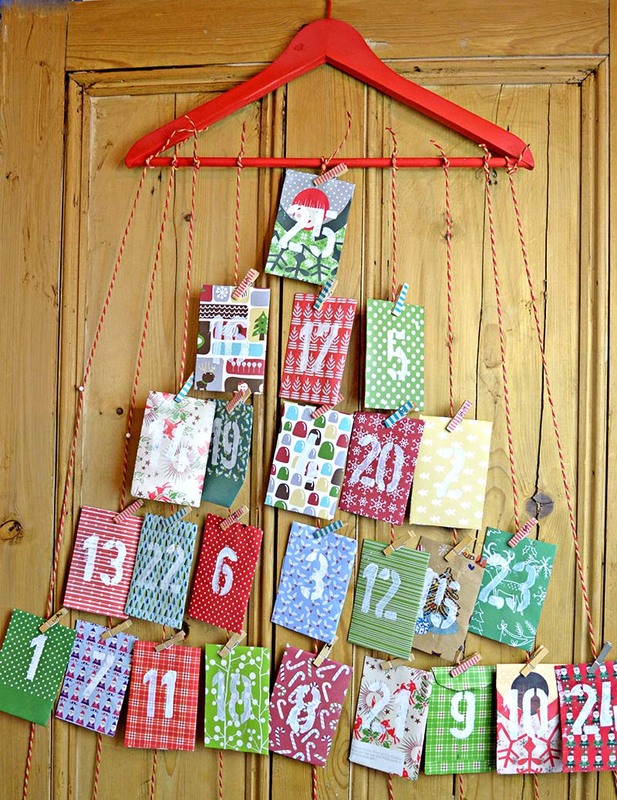 This is such a cute and cool idea for an advent calendar. I’ve never done an advent calendar. I think I should! Thanks for sharing at Submarine Sunday!! Thank you very much ! 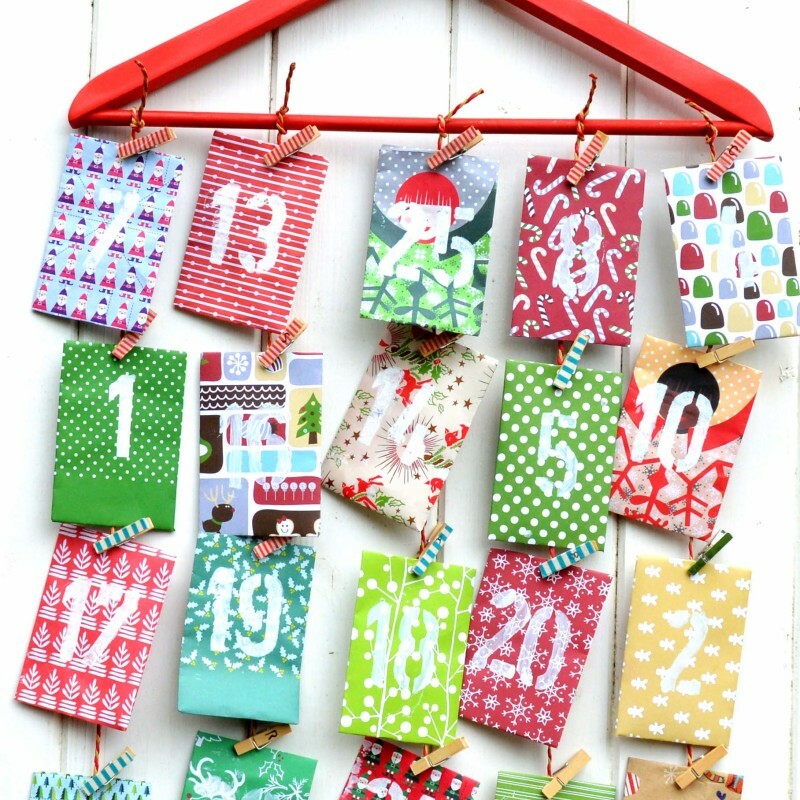 I think homemade advent calendars are fun you can use them year after year and fill them with whatever you want and make them more personal. This is just the best ever advent calendar I have seen! It’s awesome and I am going to make it for sure!! Thanks for the big up ! Good luck and enjoy making it, I’m sure it will look awesome. These are just absolutely adorable. Especially the part where we put the chocolate in the envelopes. The cheesy jokes are f un too. Pinning! Thank you so much ! They are so simple to make as well ! What a cute calendar. I bet the kids love it. Thanks ! they do love it especially the chocolate treat. love the little jokes 🙂 This is such a great idea, I had been thinking of doing an advent calendar for the grands. I like the random order for sure, work for it baby!! Thank you ! The jokes are a nice fun touch. I love the colorful envelopes and also the randomness. I always prefer randomness to symmetry too. Thank you for sharing with us at #HomeMatterParty. We would love you to have you again next week. Thank you for visiting. That’s me colourful and a bit random, well with my crafts anyway. We are seniors now…our children are grown and moved away…but what fun for my sweetie to be reminded of how much he is loved and appreciated….the treat and joke appreciated by all ages…thank you for sharing this simple but adorable craft…. Thank you, you are never too old for an advent calendar. Great project! This little envelopes are adorable and I really like the idea of adding a cheesy joke for each day. Thanks for sharing with us at the #HomeMattersParty link party. Thank you ! A cheesy joke is a great way to start the day. What a fabulous idea . . . and so much colorful, cheerful fun. Am going to share this with several friends! Thanks! Thank you it’s really nice to know that you like it and are going to share it !